Summer time is coming and it is obvious beaches would be populated a lot with people. Some of them would simply lie down on benches to get their body tanned while some would take evening walk or play games in water or would swim or play water-sports. Everything deals with beaches and water, so it becomes important how you dress up for the place. Swimsuit is available in the market and it should be worn if you are going to swim or lay down for tanning. But along with clothes, it is important which sandals you pick up for beach. The sandals which you wear in day-to-day life, going to pubs/discotheque or offices or some evening parties, can not be worn to beach. Beach sandals are different from these and should be bought carefully. - First and foremost thing which should be kept in mind while selecting beach sandals is that the sandals should be easily worn and removed from the leg. You can sit at the bench at one time or can play some sports in water at other time. So you should select beach sandals in which you can get in and out easily without any difficulty. - At beach it is obvious thing that your legs will get in contact with water and sand a lot. So it is advisable that you select the sandals which are open and has no space where water/sand can get accumulated. - Make sure that water doesn’t affect the material of the sandals. Like leather sandals should not be used in water as leather can get damaged if used in water. So you should pick sandals which is can be used in water. Also make sure that it doesn’t get affect by bacteria and get destroyed easily. - Heels are not recommended to be used at beaches as they can get useless easily. Also, by wearing heels walking in water can be difficult. So, flat sandals are recommended to be used. If also you have to go with heels, then choose wedge heels. 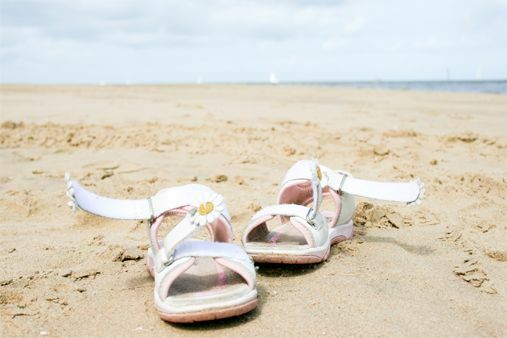 Also keep the sandals as simple as possible as the bacteria or other contaminants in beach water can affect your sandal. Choose flip-flops or slippers or simple flat sandals. - Some slippers can have back strap so that they remain fix at one place. You can choose them as they are a good choice for beach sandals. You can also choose flat sandals which don’t have any back strap and can be easily taken out. The sandals with Velcro are also acceptable as they can be removed from the foot easily. If you are going with heels, it is advisable that you choose the ones which have back strap as this will reduce the chances of you falling down. Red, blue, yellow, green and other colored flip-flops are the best for beach sandals. Choose the sandals carefully and make sure that it is well applicable to be worn at beach. Keep the above points in your mind while selecting the beach sandals for yourself. There are some websites which do sell good beach sandals, you checkout those sites and select a good one for yourself too.